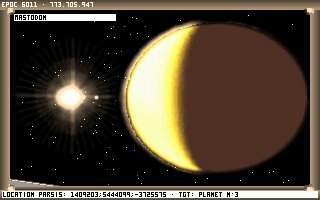 Noctis IV is an open source space simulation game that is remarkable for modeling a vast, fictional galaxy (over 78 billion stars) but having a file size that is around a megabyte. There is no goal in Noctis (Latin for of the night) other than to explore the galaxy in your spacecraft, called a Stardrifter. Many of the planets in the game can be visited on foot and feature a variety of weather and atmospheric effects, as well as plants, animals, and even ruins.